Found another problem with building the package. Everything worked well when we had all the FPGA calls directly in RT Main.vi. We included the bitfile in the project and pointed the FPGA calls to that project. Built the package without problems, installed and created the first project and were happily surprised with the correct bitfile being loaded. One minor thing we needed to do was to get rid of autopopulating folders, otherwise right clicking on the autopopulating folder and selecting explore would point us to the Project Templates folder, right clicking on the files inside the folders and selecting explore would send us to the correct location (newly created project directory). Virtual folders did not have that confusion and everything worked well. EDIT: The FPGA reference in the project created with the installed project template was pointing to the bit file in the Project Template folder, not the bit file in the new project. Once we started to create subVIs to improve readability of RT Main.vi we started to have problems. The package builds well and installs, but the resulting RT Main.vi after creating the first project is broken and the FPGA reference is not pointing to the correct bitfile. The FPGA references need to be reconfigured manually and then the project works, but it does not make for a nice out of the box experience. EDIT: The main FPGA reference points to the bit file in the project templates and the FPGA references in the subVIs point to the bit file in the source code used to build the package. We have submitted a package that works, but it would be nice if we could improve readability. Thanks again for the ideas, Fabiola. I've checked through the xlm file repeatedly, but haven't found any issues. I'm using the one from CoolMyRIO as my template, since that installs correctly on my machine. I'm still having most of the same issues. I get an error about files already open when it first installs. Then at the end of the install, I end up with a blank project instead of my project. When I go to the examples projects, mine shows up, but when I try to launch it, it does a bunch of things then closes up with no net result. Also, the bitfile issue, but I'd like to resolve these others before I even go there. E.g. I'd like to be able to open the project after it installs! - A few typo's, capitalization issues, etc. in the folder names and the xml file. - A misunderstanding about the error pop-up that mentioned files already being open. - I originally created my project by using "Save As" with one of the NI examples. Although I completely gutted the FPGA code and had a custom FPGA VI and bitfile, some remnant of the original FPGA VI was still buried in the project, such that when one tried to create a new project for my program, it crashed after trying to look for FPGA sub-VIs that my FGPA VI wasn't even using! To resolve this, I had to create a fresh project from scratch, import all my VI's and libraries, etc. - I also ran into a weird Shared Variable issue. I was working away from home, while on a guest network and VPN'ing in to my usual. 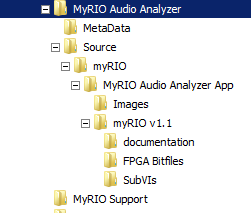 Although the myRIO was connected via USB, the same as always, something about that networking environment made the Shared Variables not communicate. Network Streams worked fine, as well as basic connection to the myRIO. When I got home the SV's were fine again. Never quite figured it out, but I'm pretty sure this goes well beyond my code, so I'm proceeding regardless of this issue. Glad you were able to solve it! I think we had the same issue with the MetaData tag that was wrong at the end. We figured it out when we tried to open the xml file with XML Notepad and it complained. Looking forward to seeing your project.